City after city, across the nation, are passing “Dangerous Dog” laws. Many cities, for example, don’t allow people to have pit bulls or Rottweiler’s. If you’ve ever owned either breed of dog, you know that dangerous dogs are made, not born. It’s not the breed that is dangerous, it is people that are creating dangerous dogs. No breeds, in and of themselves are dangerous if raised and trained properly. Dogs, as a whole, were bred to please their masters. Dogs relied on their masters for food and the masters relied on dogs for protection and companionship. What, then, makes dogs dangerous? Dogs don’t always understand English, as much as we’d like to believe they do. Instead, they take their cues from our emotions. If we’re anxious or scared, our furry friends will recognize the emotion and be fearful themselves. Like any animal, when dogs are scared, they become aggressive. The best way to avoid a scared pooch is to keep your own emotions in check and to eliminate other aggressive animals from your companion’s circle of friends. If your dog has always been easy-going and sweet, but suddenly engages in aggressive behavior such as growling or snipping at you, the poor puppy may be sick or in pain. The best way to rule out illness or pain is to visit your vet right away. Explain the symptoms to your doc and have any necessary tests run. If it’s always been just you and your four-legged friend, your doggie may be aggressive around others, especially other animals and small children. To avoid this, make sure you take your puppy out often. Start with parks. Stand outside a grocery store and let anyone who wants pet your pup. When you’re sure of his response, try the sidewalk near a school – this will make sure your pooch is used to the noises and fast movements of small children. 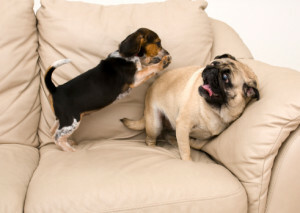 Your dog may show aggression when he feels as though something he values is being threatened. That may be his food, his bed or even his person – you. When your pup is still small, have him get used to sharing by hand feeding him from his bowl, sharing his bed with him and taking him on social outings with you. Have him get used to sharing his things and his person with others. Perhaps the most disturbing of the reasons dogs become mean is when they are taught and encouraged to be aggressive. Whether for guarding – or worse, fighting – purposes, it is WRONG to teach a dog to be mean. Instead, encourage your dog’s sweeter side. Encourage his natural tendencies – to be your very best friend. If you do rescue a dog which has been taught aggressive behavior, stock up on patience and personal injury insurance. Raising a dog with proven aggression can fall under the Dangerous Dog Laws enacted in many states. Have you had an encounter with an aggressive dog? Do you think it was because of the way it was raised or because of the type of breed? Previous post: Are “Googling” Jurors Juggling Justice?